When I opened my email and saw this challenge I knew I wanted to play along. I always save the clear plastic windows from packaging... with a shaker card in mind... so this is the perfect challenge to put one to use. The design team has created some fun cards to inspire you, so check them out and come play along. First step choose some background paper. I use to be indecisive...now I'm just not sure, but I finally did choose this lovely muted floral. I have lots of little baggies full of these punched flowers in many colors. Before discarding scraps I will use my favorite little butterfly or flower punches to punch the scraps to smithereens. This card came together rather quickly...after I decided on the flow of the flowers. I like having embellishments ready to add some dimension and interest. Which brings me round to telling you about the card candy I've been making. I got the idea from a blogger friend I follow, Loll I love everything she does...seriously, you will too! She even packages her candy so pretty. Check it out:) Her name is the link. I'm just sticking die cuts to acetate with home made glue dots. I reuse the paper that regular glue dots come on...just adding drops of Tack it Over then letting it dry. After it's clearly dry I just pick up a dot with the back of a cut then attach it to acetate for packaging. I learned this tip from another wonderful blogger...teacher... video guru... Lindsay from the Frugal Crafter If you have any crafting questions...I'm sure you'll find an answer on one of her many videos. Wanna win some card candy? 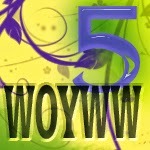 Just click the "join this site button" and join my blog, then leave a comment saying that you'd like to win. Easy peasy. We'll be friends. Then when I have 100 followers I will pick a random winner. Now here's the thing... you have to let me know you would like to win, I don't want to waste my time if you have no interest. I will need some contact information to inform the winner so leave a link for me to return to you. You can see more of the candy I'm offering in previous posts. I'm having fun playing with these embellishments...you could too! Good golly the time flies...time to make dinner for Mr. Bill. Thanks for visiting I'd love to return the favor, so just leave a comment with a link. See you there. 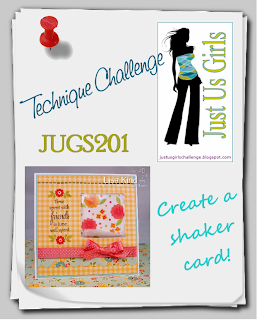 How fun you used bflies as the "shaker stuff" -- very cute~ Thanks for joining in at JUGS! Love your flower shaker card! Very pretty! Great glue dot tip! Thanks for playing with Just Us Girls!